Please join the NYC Alliance for School Integration and Desegregation (nycASID) for a book talk with UC Berkeley professor Rucker Johnson, author of Children of the Dream: Why School Integration Works. 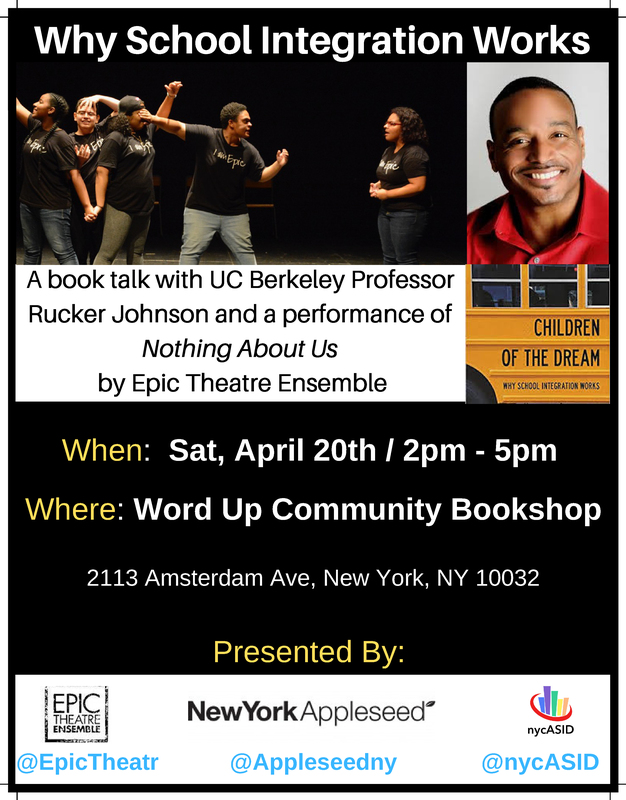 The talk will be preceded by a performance of Nothing About Us, a play about educational segregation, written and performed by New York City public school students from Epic Theatre Ensemble. Performers will also lead a talkback after their performance. Commissioned by New York Appleseed, Nothing About Us is a rigorous, passionate, and hilarious exploration of educational segregation written and performed by those most affected and least consulted: NYC public high school students. What does separate but equal mean to us today? Transformation, empathy, and youth voice drive the conversation in this 30-minute touring play by Epic NEXT. Rucker C. Johnson—author of Children of the Dream: Why School Integration Works (April 2019, Basic Books)—is an associate professor in the Goldman School of Public Policy at the University of California, Berkeley, and faculty research associate at the National Bureau of Economic Research. As a labor economist who specializes in the economics of education, Johnson’s work considers the role of poverty and inequality in affecting life chances. Johnson was one of 35 scholars to receive the prestigious 2017 Andrew Carnegie Fellowship. His research has appeared in leading academic journals and in mainstream media outlets, and he has been invited to give policy briefings at the White House and on Capitol Hill. Johnson is committed to a scholarly agenda of fusing insights from multidisciplinary perspectives to improve our understanding of the causes, consequences, and remedies of inequality in this country. Johnson earned his Ph.D. in economics at the University of Michigan. At UC-Berkeley, where he has taught since 2004, he teaches graduate and undergraduate courses in applied econometrics and topical courses in race, poverty, and inequality.